Ladies and Gentlemen….my commute is over!!! I’m so excited (and we all know that my usual level of excitement is abnormally high) to start working with the CIA (www.ciachef.edu) in less than one week! In the meantime, I get to soak up this week of my own little “stay-cation” at home, allowing time to reflect on what’s about to happen. Woke up – made coffee & breakfast (egg whites, scrambled with sautéed mushrooms, topped with feta cheese) – snuggled with Stella while watching Good Morning America (TOTALLY my pick over the Today Show by the way…major new fan of “GMA”) – did laundry – ran 4 miles with Stella – made lunch (power salad! arugula, avocado, tomatoes, broccoli, and sprinkled with chunks of cheddar cheese) when Sean came home – went to Target – came home and cleaned up a bit – made a delicious dinner with Sean (spaghetti with sausage, and a side of garlic bread), watched T.V. … but got restless … so I made chocolate chip cookies from scratch (yep…same recipe from this post: cookie baking time lapse), finished the night laughing hysterically at our new favorite show, “Duck Dynasty.” End scene. Today I set up my new “office space” here at home. 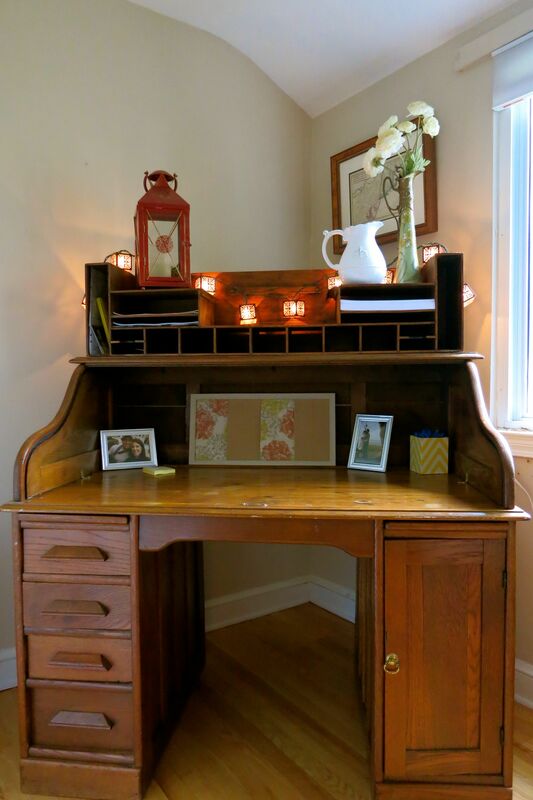 Now, this bad boy seen below is no ordinary desk – it’s my great-Grandfather’s desk. His name was William McKay, and he was from St. Paul, North Carolina. When my parents recently moved out of their home in Pennsylvania for their retirement in the North Carolina mountains, I was thrilled to inherit this beautiful roll-top antique desk. I’ve jazzed it up a bit to be a little more “Katherine” and girly…but I can’t even begin to tell you how happy I am to get to work here. I especially love thinking about how happy great-Grandaddy McKay would be if he knew that his desk would be home to three generations: his daughter’s family, and then her daughter’s family, and then even further to HER daughter’s new family (our little Mason home!). This desk has already brought me so much joy. I can’t even begin to tell you all how lucky I feel to have this new sense of career independence, such an exciting company to work for, the life I’ve been dreaming about for years, and a chance to celebrate our sweet family throughout our home. I can’t wait for all that’s in store for this life-changing switch. And on that note…it’s time to get ready for my first ever mid-day Zumba class!!! You are going to love it! To be honest, it takes a little while to get adjusted to working from home. You have all of this time and have to figure out how to organize your day! As time goes by in your new job, you’ll be busy as a bee, though, and your day will fill itself! I love waking up and making myself a healthy breakfast and sitting down at my desk with no distractions. Congrats!